Sinn Féin says claims by an Alliance Party MLA, that it wanted 10% of future civil service recruits to be Irish speakers, are wholly inaccurate. The Alliance Party's Kellie Armstrong claimed it was part of Sinn Féin's demands for an Irish language act. She said Alliance believes there should be a stand alone Irish language act, but the content had to be negotiated. But Sinn Féin's Máirtín Ó Muilleoir described the claims as "bunkum". "Sinn Féin wants to see an Irish language act which is stand alone, which is strong but also prudent and practical," he said. "I think we can do that to deliver rights for Irish speakers and stop discrimination." "But there is no basis to the Alliance party claim." However, Alliance's Ms Armstrong stuck by her claim, and told the BBC that Sinn Féin wanted "the sun, the moon and the stars options". "In the early stages of negotiations we had a bilaterals with Sinn Féin where that figure was discussed," she said. "We don't see that as a type of percentage that is appropriate at this stage. 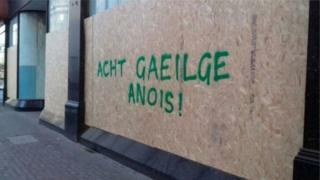 "It may well be a natural progression to that once the Irish language act is in place." She said that the 10% figure had initially come from a paper from the Irish language group, Conradh na Gaeilge (CnG), earlier in the talks process. The former Department for Culture, Arts and Leisure (DCAL) published a consultation on an Irish Language Act in 2015. One of the measures proposed was "some affirmative action in favour of Irish speakers in recruitment to the civil service" and other public bodies. A discussion document on a language act published by Conradh na Gaelige in March 2017 gave more detail about proposed changes in the public sector. It said that: "10% of those who are appointed should have both spoken and written Irish in the future." However, the document also said that an Irish language commissioner should ultimately decide upon the required percentage of speakers in each department and public body. Northern Ireland has been without a functioning devolved government since January, when the coalition led by the two biggest parties, the DUP and Sinn Féin, collapsed over a green energy scandal. Talks to restore devolution have been paused and no progress is likely before September. On Tuesday, Secretary of State James Brokenshire said he would "reflect" on his next move after the talks failed.